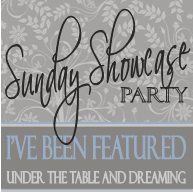 In case you missed my guest-post at A Little Lovely the other day, here it is! For less than $2.00/apiece you can make a pretty little frame for your friends that still looks like it belongs under the tree even after it's unwrapped! These are a great gift because they are so easy, fun, and CHEAP! The main ingredients are one unfinished wooden frame from Michael's ($1.00), a scrap of Christmas wrapping paper, a bow, and some craft paint. And if you're like me, you already have most of this stuff around the house anyway! First paint the sides of the frame and the inside ledges. Don't worry about making it perfect! The front will all get covered up anyway. I used acrylic paint that's less than a dollar a bottle. Roughly cut out the shape of the frame from the wrapping paper. You can see here that my cutting job was VERY rough. :) It doesn't matter though because we'll just file the excess away later. Spread a very thing layer of Mod Podge on the frame and place the wrapping paper on top of it. Smooth away the bubbles and ripples that will apear as best you can. Let it dry for a bit and then take a sanding block (or in my case what was handy was an emory board) and file downward on the edges at a 45-degree angle. The paper will be sluffed right off and you'll have a perfectly-fitting design on your wood. and hot glue a bow in the corner. That's it! 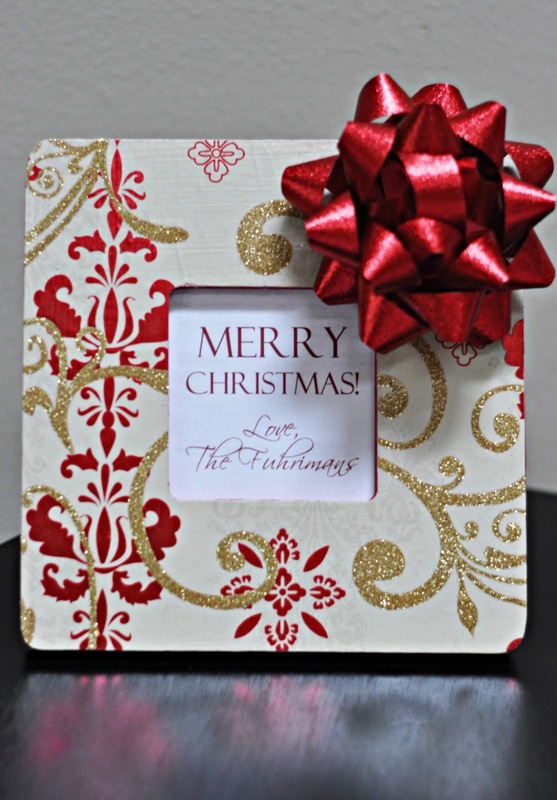 A perfect little frame that looks like it could be a gift under your tree! These would be ideal for your friends to put their yearly family Christmas picture in! Don't forget to check out and enter my Say It On the Wall vinyl giveaway, going on now! That's such a cute little frame. What a perfect gift. I am gonna do this!!! I love this idea! The paper you chose is gorgeous. This is gorgeous! I had no idea that was wrapping paper! What a lovely gift! Wow, what a great idea! It's adorable! And the possibilities are endless. They would be so cute with any scrapbook paper/bow/flower/jewels for any room/season. LOVE it! Thanks! I made one of these as a test the other night after seeing your post. It was so easy! I'm making several for gifts but using scrapbook paper that I already have on hand instead of the wrapping paper so they can use year 'round. Need to find some kind of embellishment for them though. I'm going to try and make these as favors for a couples Christmas shower that I'm having! great idea & tutorial! I LOVE this project, I'm going to do it for a Craft Exchange I'm doing. Thanks for the really awesome project. Such a cute idea, my mom bought these frames a while ago and has made some cute frames out of them. I think this will be GREAT for my Visiting teachers! And for the Girls I visit! Thx.. I love the Paper too. Now I need to find some great paper! I love this idea! I'm definitely doing multiples of these for gifts this year. I've included this link on my blog for my friends to see, also. I can hardly wait to get started! Thanks for this wonderful project! Merry Christmas! thanks for this tute...I cannot wait to find beautiful gift wrap to make these. I have 12 girls at work that I buy for every year. This will be an inexpensive but impressive gift. love this! Would work for any occasion too, I bet you can use scrapbook paper too? Cute cute cute! Can't wait to try! How simple and yet how elegant! Thanks for sharing! This is absolutely wonderful and amazing. I love how easy it is and I didn't know that about sanding or filing off the excess. I love the paper you chose. What a fun project. Don't you love doing these frames!!! funny....I have some made with Christmas paper and bows to post about too!! LOVE yours too!!! Thanks for sharing and linking up!! Beautiful! I've actually been experimenting with almost the same project do with a local moms group that I'm a part of. I hadn't thought to make the frames "Christamsy" and use the wrapping paper like you did. So fun! You can definitely use scrapbook paper too! It rumples less which is nice, but is also thicker so it's a little harder to file off. Both papers work great though!! Wow! I love this! Can I make one for myself and not give it away? I never would have thought at first glance that it was wrapping paper. I thought you had done that cool glitter design yourself. I love the way the frame is embellished but still looks clean. Thanks for the excuse to buy more wrapping paper! So pretty! Love the wrapping paper you used. Do you remember where you bought it? I'm kind of addicted to wrapping paper! I love this! So cool! 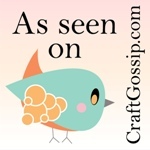 Thanks for linking up to Making It With Allie! I can't wait to see what you have for next week! This is, without a doubt, the cutest thing! Just found you on lambaround and love your neat frame idea. I want to be more crafty but always feel like things will be too hard. Have also never learned how to modge podge. Thanks for the tutorial! Very cute idea, love it for the neighbors! Wow! You really transformed this! Wonderful job, I love it, very pretty! Love the idea of using wrapping paper instead of scrapbook paper! Very cost effective! Would you mind if I featured this project/your blog on my blog? I know my readers would love this as well! Love this idea and I have a few of these frames that I wasn't happy with in their first incarnation! Thanks for sharing such a great idea! It's going on my list of projects to do this year. This is absolutely adorable! I was actually going to make something like this for my own house this year with a photo of me & my husband from Christmas last year. I only decorate in black & silver for Christmas so I thought it would be cute if I used the wrapping paper I use for a frame. yay!! Link up with Giggles, Glitz & Glam! great idea, looks really cute! This project turned out great! 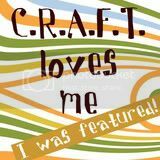 It's a great craft item with flair. Ca Ute! Thanks for planting your creative seeds at Plant a Punkin Seed Party! This turned out lovely! I love that wrapping paper. 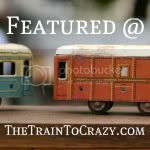 Thanks for linking up to Topsy Turvy Tuesday's. I was at Target on black friday looking for wrapping paper for this project bc I loved it SO much and I bought some awesome paper I came back to look at the tutorial again and I bought the EXACT same paper (I thought it was similar but never would have guessed I'd pick up the same one). I hope mine comes out as good as yours! I love this! I am having a hard time lately with the mod podge wrinkling my paper real bad. I am afraid to try it on wrapping paper! I am using a real thin layer...any suggestions? I absolutely Love this and will make some of these for sure. Wow! I realize that I finally found your blog well after Christmas, but I love this idea and I'm thinking of a Valentine's version! Just came across your post (a year later!) and I absolutely love this idea. The emory board trick is super smart - I always wondered how one could cut the paper perfectly to match whatever they were Mod Podging it to. Also good to see that you can use wrapping paper, since I was thinking of doing a similar project but to make Christmas coasters.